That grumbling sound you might have heard in the distance the last couple of days may not have been thunder. It might have been me voicing my frustration at our hit and miss (mostly miss) ability to access the internet. So, since I couldn't do those things I decided to be a domestic goddess (of sorts). I cleaned the oven and the stove cook top. I cleaned and conditioned the teak wood "floor" in the shower. I posted all the expenses so far this month onto our excel spreadsheet. I have finished about 50% of our spring "redecorating" involving new curtains and cushion covers and new pillows in the living and dining areas made from upcycled items from the charity shops. I tried a recipe I had found earlier for Donner Kebabs made at home. I have always been drawn to those kebab shops that have the huge cylinder of meat in the window that they have cooked and then slice off in portions for your kebabs. Well this recipe is for doing a similar thing at home but without the huge cylinder. You use ground meat (lamb is traditional but beef or pork would work). Now I know it says Italian Herbs. Think Mediterranean instead. That part of the world often uses mainly the same herbs and spices with their own little twists of individuality. Mix everything listed above together VERY well. Squish it all together until it holds together well. 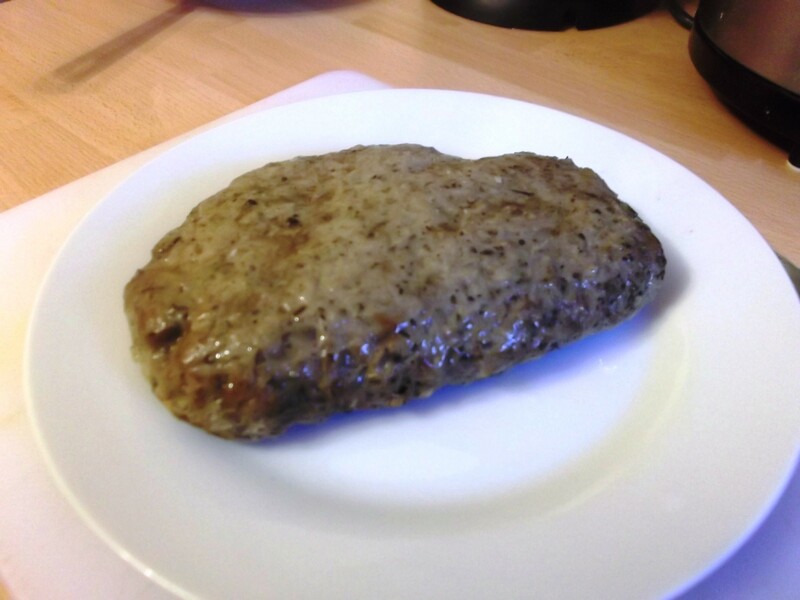 Shape it into a flattish loaf that will lie in the bottom of your slow cooker – this is about 5 cm thick. It should stick together fairly well. This is now called the donner (don't know why). Cook on HIGH for three hours. I didn't have a slow cooker so I used a nonstick fry pan on low heat and on top of a heat diffuser so it would cook very slowly. Ten minutes before serving remove the donner from the slow cooker and leave to rest before carving. Very finely slice the lamb donner ….. your sharpest knife and a steady hand are needed. In Turkey you see them carve this with razor sharp knives the length of your fore-arm. Split open a pita – stuff with four pieces of donner meat, large helping of tomato, cucumber and onion and a dribble of tsatziki sauce. If you don't want the bread, eat it like a salad.